For Ingrid Burgos, 18, being crowned Señorita Cicero this past weekend was truly an exhilarating experience, one that continues to bring on the butterflies. “I still cannot believe it,” said Burgos. “When I think about it I get butterflies in my stomach. I am so excited to do great work for my community of Cicero.” The Dominican University Freshman, where she hopes to enter the business administration field, was crowned Señorita Cicero during the Cicero Mexican Cultural Committee’s annual pageant at the Cicero Community Center. “From the very beginning, the girls and I had so much fun together and I learned so much. I’m looking forward to representing and impacting my community,” said Burgos. Burgos competed against several other young women throughout the night in a series of presentations including displaying traditional Mexican costumes, talent and a series of questions and answers, among others. Lawndale Bilingual Newspaper spoke with Burgos about her plans for Cicero. 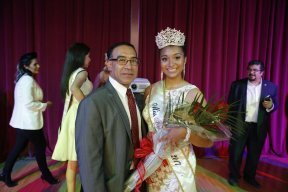 Lawndale Bilingual Newspaper: Congratulations on being crowned Señorita Cicero. What does being crowned mean to you? Ingrid Burgos: Thank you so much. Being crowned Señorita Cicero means so much to me because it serves an opportunity to impact my community, the community I love so much. What do you hope to accomplish as Señorita Cicero? In my platform I stated my passion for becoming a motivational speaker to youth and working closely with the homeless community. I feel it is important that we as a community teach the importance of volunteering in whatever capacity; whether it is mentoring students, volunteering at food pantries, volunteering at nonprofit organizations, or nursing homes. I love how much Cicero has changed and how much it has to offer residents and I feel that we should all give back so we continue to transform our community. There are so many events throughout the year, but what I look forward to the most is Toys for Tots because I hear that is one of the most impactful events. I just look forward to working closely to my community and having the opportunity to represent Cicero. What advice do you give to young girls who are interested in participating in Señorita Cicero next year? Just do it! Regardless of whatever the outcome might be, just do it. You have to keep setting goals for yourself so that you continue to develop and gain as many experiences as possible. Never sit too long in your comfort zone, there is always room to grow. This was one of the most amazing experiences. I worked with so many lovely people who were kind and made the experience so much fun. To young girls I have to say, believe in your dreams and find a way to accomplish them.